It's time for baby bird to leave his nest, but he declares, "Nope!" because he's not going. He looks down from his nest and imagines the dangers that may be waiting for him on the ground. 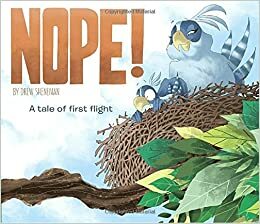 With a little help from mama bird, baby bird changes his "nope" to "yep." This is a mostly wordless picture book, with the expressions of the birds telling most of the story. It's a funny, sweet tale about the fear of trying something new. This is the third book in the "Cody" series and, as in the previous two, Cody learns life lessons to navigate the ups and downs of growing up. Cody is convinced by her friend Pearl to trade her special toy, but soon finds she misses Gremlin terribly. When Cody secretly steals Gremlin back, she begins to wonder about whether or not she's done the right thing. Cody is a delightful character, not always making the right decision, but always showing her love for life, family, and friends. The characters are true to life and the issues that Cody faces are those that early readers will find relatable. 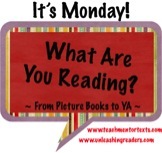 This chapter book would be one suitable for readers just transitioning to longer texts. Julia, a middle schooler, is unhappy with the fact that she is short for her age. She is also unhappy about the fact that her mother makes her audition for The Wizard of Oz and, along with her younger brother, she is cast as a munchkin. Julia must spend her summer rehearsing, but she soon starts to enjoy herself and take her role in the play very seriously. Julia discovers much about herself through her experiences. Julia is funny and determined. The cast of quirky characters and the plot that gives insight into the experience of acting in a play make it an interesting read. This is a heart-warming slice-of-life story about how new experiences and supportive role models can help one change perspective and grow in self-confidence. I can't wait to read Short! So excited to see it reviewed here! I couldn't wait either. I'm glad my library got it so quickly. 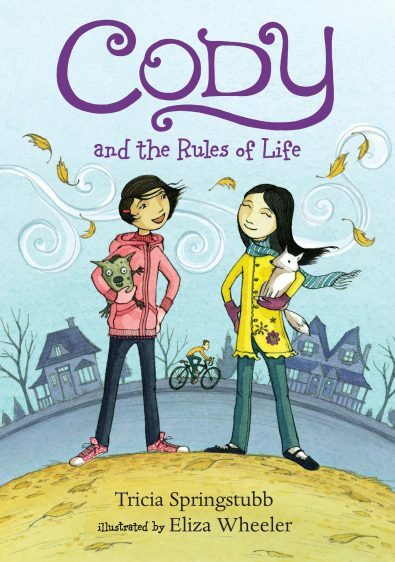 Upon seeing that Cody and the Rules of Life is written by Tricia Springstubb, author of Every Single Second, I'm interested in reading it. I'm waiting for Short. I do like her writing and I should read something else by her as well. Nope! looks so fun - I love picture books that use expressive illustrations, and let children interpret what's happening in each scene. I'm sure this one will be a fun one to read aloud with! Wordless books are fun to share with children! Nope! looks fun, and sad to say, I'd forgotten about Short! Will put it on my list again! Thanks, Lisa. I'm glad my library got Short so quickly. I had put it on my #mustread2017 list so it's good to check one off! Definitely going to check my library for Nope! It looks like an adorable picture book. Have a great week!